David Gillick’s weekend brunch for two is inspired by the wintertime Riviera flavours of sage, nutmeg, thyme and garlic. These pancakes are naturally high in protein and work just as well for lunch or dinner. 1. Put the saffron in a small bowl with the white wine vinegar and set aside to soak. 2. Toast 50g of the drained chickpeas in a non-stick pan on a high heat with 1 tablespoon of the oil. Remove from the pan, season with salt and pepper and set aside. 3. Make the pancake batter by placing the remaining drained chickpeas and the remaining 2 tablespoons of oil in a blender with the eggs, milk, flour and saffron vinegar. Season to taste with salt and pepper. Blend on high speed until completely smooth. Turn off the blender and scrape down the sides, then blend again until smooth. 4. Put the pan that you toasted the chickpeas in back on a medium heat. Ladle in half the batter, without adding any extra oil, and swirl it around the pan. Cook for 3 to 4 minutes on one side, until you can easily slide a spatula under the pancake and it’s firm enough not to break when you flip it over. Flip the pancake carefully and cook for another 3 minutes, until lightly golden. 5. Repeat with the remaining batter. 6. Spread 1 tablespoon of onion relish on a warm pancake, top with grated cheese and a handful of spinach and kale, roll up and cut in half. 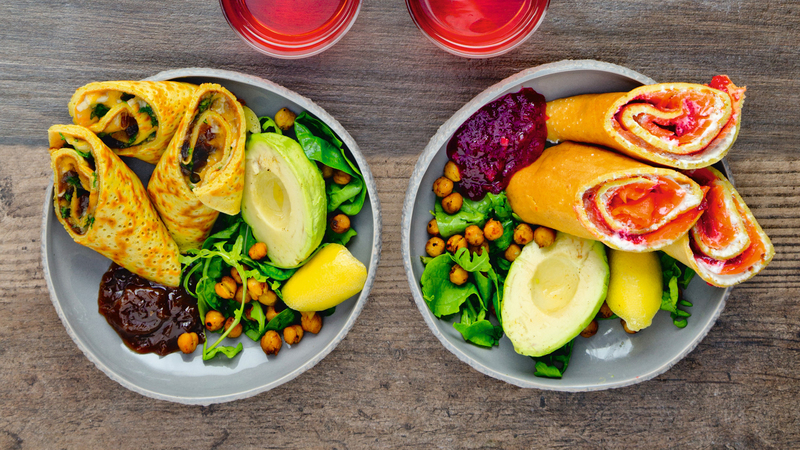 Spread 1 tablespoon of beetroot relish on the other pancake, then top with the crème fraîche and smoked salmon, roll up and cut in half. 7. Serve the pancakes with the remaining spinach and kale and relish along with the toasted chickpeas, halved avocados and lemon wedges. These pancakes can be made in advance and reheated in a pan. They are naturally high in protein and work just as well for lunch or dinner.